Owner Marueen Ravelos says that her dog, Riley, is more like a person than a dog. 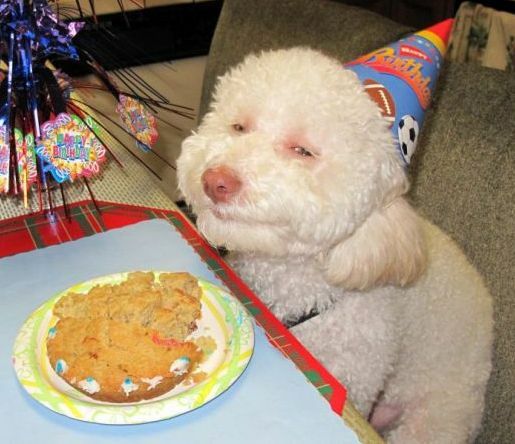 That can certainly be said of his expression, as this bichon frise/poodle mix’s contented grin at a birthday party is eerily similar to the grin of a person. Granted, it’s a person after a visit to Marijuana University, but a person nonetheless! Maureen says of Riley, “Riley always makes faces like this, and that’s the best part about him. He gives you a new facial expression every time that you forget he’s a dog.” People tend to anthropomorphize their pets, but I can see she makes a great point with Riley’s expression in that photograph.